I don't normally tend to do many make-up and beauty related posts which are not hauls but I am hoping to branch out a little more. I am not expert in make-up and most of what I do know has been learnt from bloggers, youtubers and magazines. I am thinking about doing full reviews on some of my make-up items so if anyone wants to me do some make-up reviews leave a comment below. 001. The first on my list is the Olay gentle cleansers refreshing toner. I have been using this for a over a year now but I have come to love it even more recently. I have very sensitive skin and eyes so taking make-up off can be tricky however this is super gentle and gets all my make-up off. I used to use an eye make-up remover (as seen in my skincare post however I have recently started using this to take my eye make-up off as well as a toner. 002. 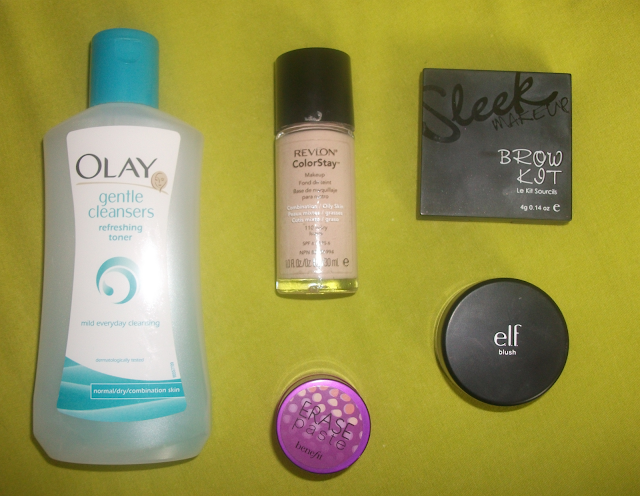 The second item is the Revlon ColorStay foundation for Combination/ Oily skin in 110 Ivory. I have very pale skin and I really struggle to find foundation that actually matches my skintone as most ivory shades are too dark for me. I bought this after hearing Leanne rave about it as she also has very pale skin. This shade is perfect for any pale girls out there. 003. Another favourite of mine has to be the benefit erase paste in 01 light. I have really dark under eye circles plus I have very pale skin which makes them look ever worse. This product is expensive however if like me you will do anything to get rid of those dark cirles. It doesn't completely get rid of them, I am yet to find a product that does, but it really reduces them and makes a huge difference to my eyes. 004. The sleek brow kit in light is my holy grail brow product. I have wanted this for so long and I have seen so many rave reviews that I couldn't wait to get my hands on it and it has not let me down. I do not know how I did my brows before this but I am never going back, I can see this being a staple in my make-up collection for years to come. The shadow and wax are the perfect shades and the colour can easily be built up. 005. The final product in my favourites is the elf mineral blush in joy. I got this product last year in the elf mineral starter kit and I never really bothered with it as I am not a huge blusher fan as I have quite red cheeks. I decided to give it a go one day and I am so glad I did. As it is a mineral blush the colour is quite light (perfect for me) but it can be built up for evenings. I struggled to take a picture of the blush which was true to colour but the few bits in the black lid are very close. I've heard great things about Erase Paste. I really need to try it. Where can you get the sleek brow kit? I love your blog! Please check out mine! It would make my day if you followed my blog!